Congratulations Roxane Slade, last week’s winner of our Catch the Ace weekly prize! 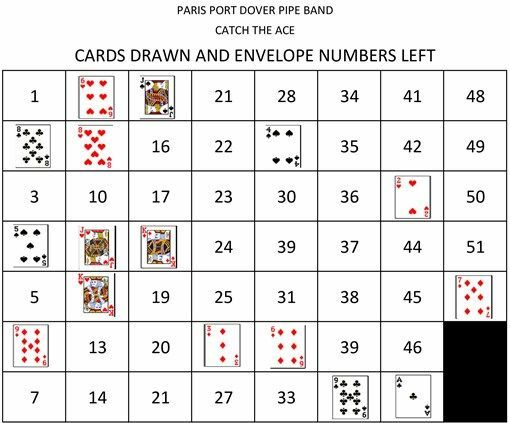 Unfortunately, your envelope choices of 33 and 39 revealed the 9 of Hearts and 10 of Diamonds….not the Ace of Spades. The game moves on to week 15 with a jackpot in excess of $1 429.00! Thank you to the owners and staff of Dragon Sports Bar for the use of your venue for our draw every week. Congratulations Nancy McLea, last week’s winner of our Catch the Ace weekly prize! 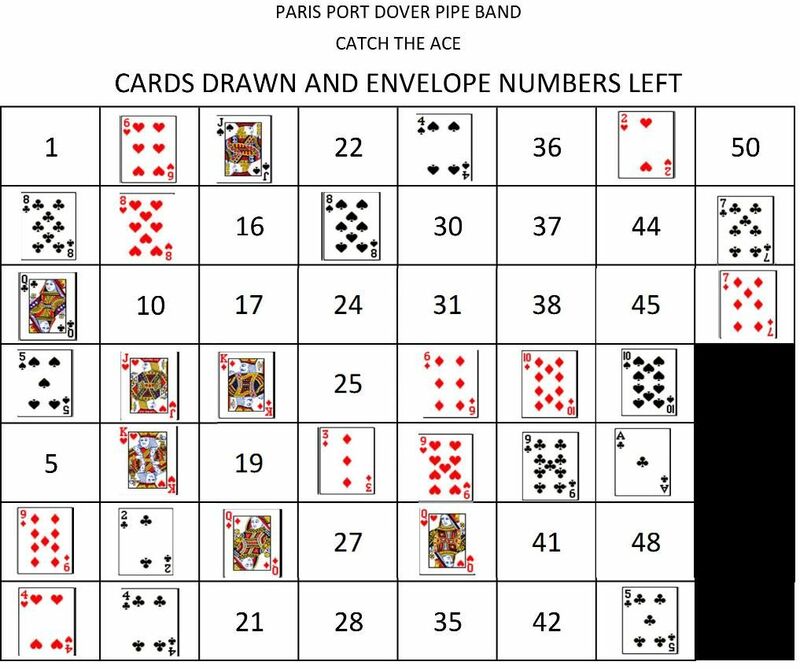 Unfortunately, your envelope choices of 20 and 46 revealed the Queen of Diamonds and 10 of Spades….not the Ace of Spades. The game moves on to week 14 tonight with a jackpot in excess of $1 400.00! Contgratulations Bradley Smith, last week’s winner of our Catch the Ace weekly prize! 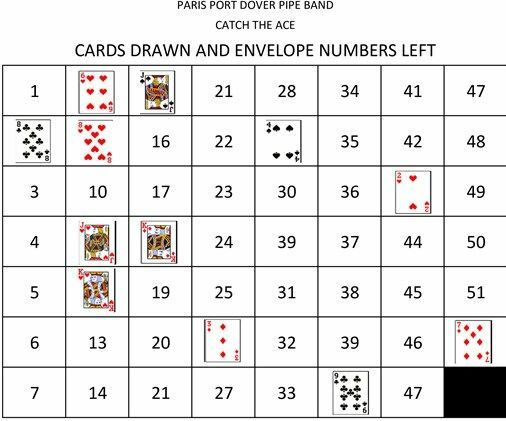 Unfortunately, your envelope choices of 13 and 34 revealed the 2 of Clubs and the Queen of Hearts….not the Ace of Spades. The game moves on to week 12 with a jackpot in excess of $1 147.00! Contgratulations Lorraine Lopes, last week’s winner of our Catch the Ace weekly prize! 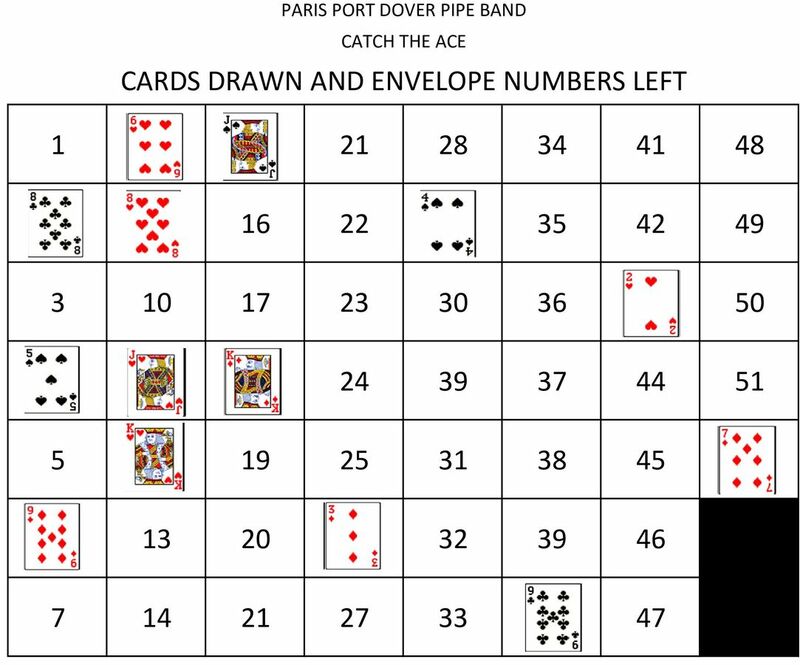 Unfortunately, your envelope choices of 7 and 23 revealed the 4 of Hearts and the 8 of Spades….not the Ace of Spades. The game moves on to week 11 with a jackpot in excess of $1054.00! 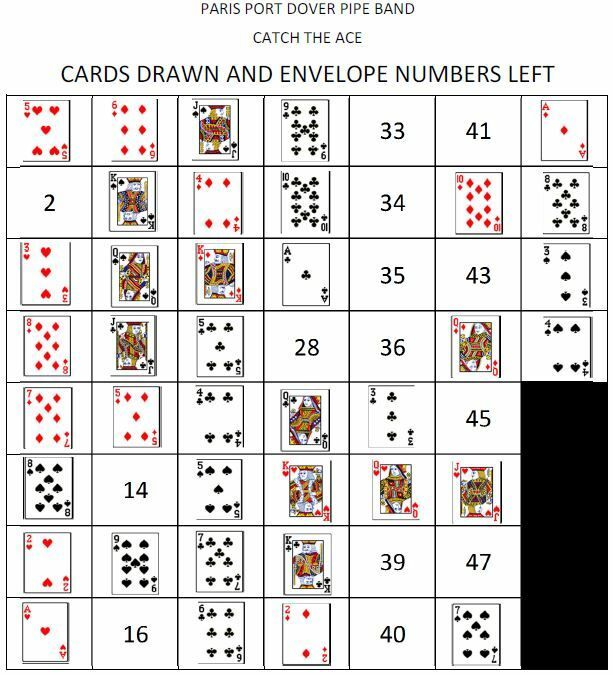 Catch the Ace - Week 9! “Contgratulations Sharon Medland, this weeks winner of our Catch the Ace weekly prize! 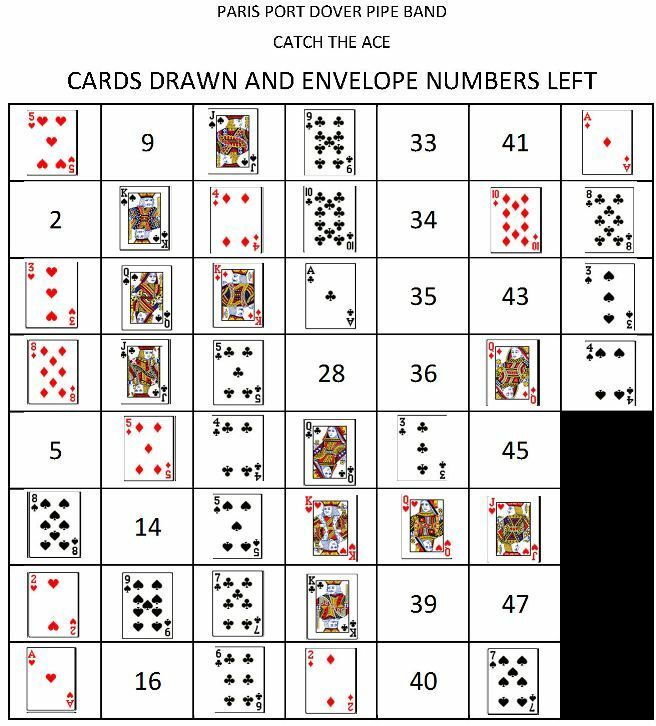 Unfortunately, your envelope choices of 14 and 49 revealed the 4 of Clubs and 5 of Clubs….not the Ace of Spades. The game moves on to week 10 with a jackpot in excess of $1000.00! Congratulations Fred Beale (friend of Frank Anderson), this weeks winner of our Catch the Ace weekly prize! 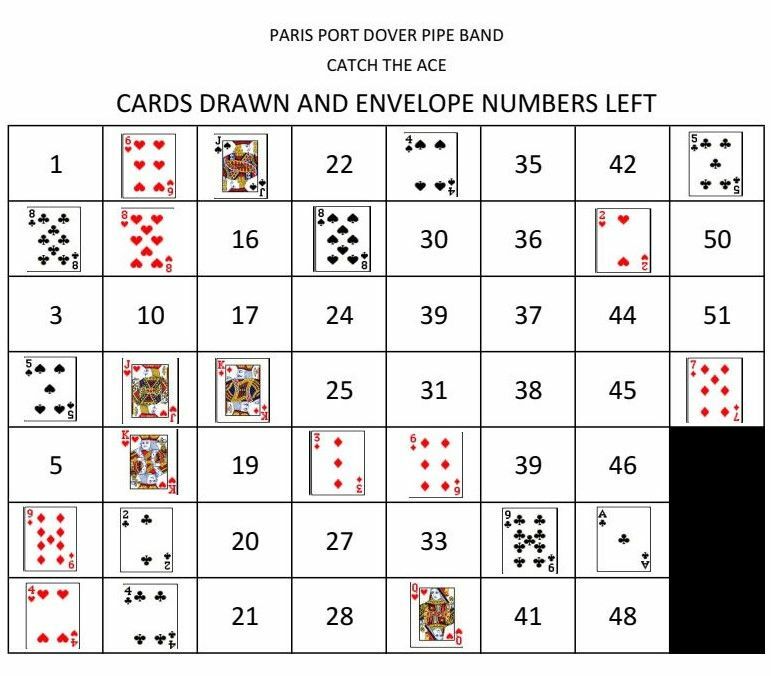 Unfortunately, your envelope choices of 32 and 47 revealed the 6 of Diamonds and Ace of Clubs….not the Ace of Spades. The game moves on to week 9 with a jackpot in excess of $900.00! Catch the Ace Week 7! Congratulations Tony!!!! This weeks winner of a prize of $65.00! 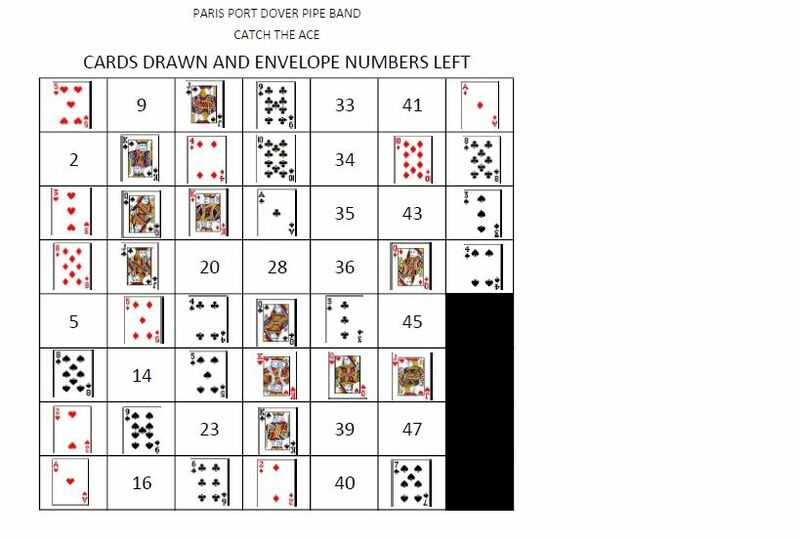 Tony chose envelope 4 and 6….a bold move to pick two envelopes so close together….unfortunately the gamble did not pay off. 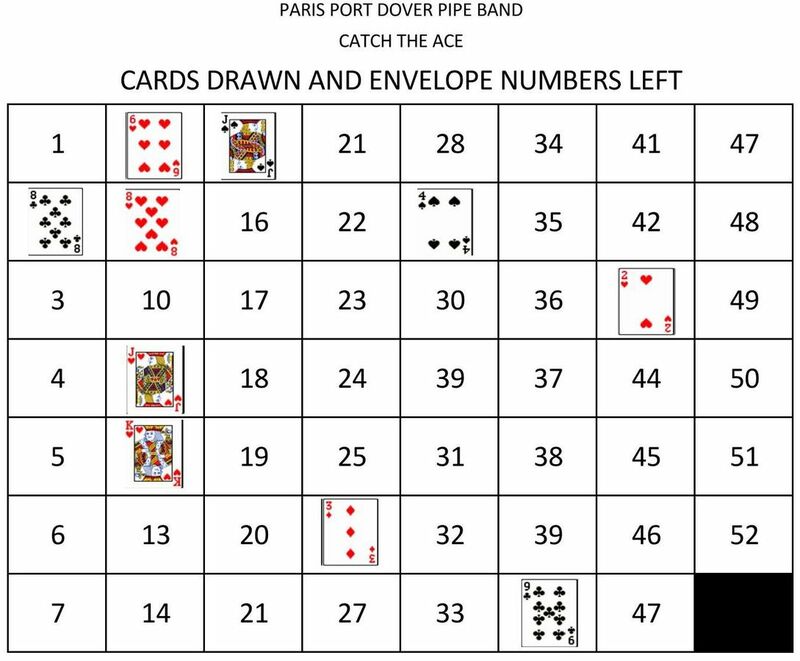 The 4 envelope revealed the 5 of Spades and the 6 envelope was hiding the 9 of Diamonds…. The jackpot is now at $724.50…and will be over $800.00 next week! Frank Anderson is our weekly winner! Frank chose 18 and 52 for his envelope choices which contained the King of Diamonds and the 7 of Diamonds…no Ace of Spades but Frank took home the weekly prize of $68.00….Congratulations, Frank! The jackpot is now at $627.00…creeping ever closer to the $1 000.00 mark! Congratulations MarieAnne Anderson, our week 5 winner (our first ‘two week in a row”)! The payout was larger this week at $73.00 and the support was HUGE AGAIN! Many band members out to support the draw. Brad reigned-in in his usual enthusiasm for a quieter, more subdued commentary in recognition of the couples that were enjoying a romantic dinner. The guest ticket puller was none other than Bernice Emery. Our winner had indicated envelope 2 and 9 as her choices which contained the 8 of Clubs and the 8 of Hearts….the Ace of Spades did not reveal itself on Valentine’s Day. Catch the Ace - Week 4!!! Congratulations MarieAnne Anderson, our week 4 winner! The payout was small, $52.00 but the support was HUGE! So many band members out to support the draw. The guest ticket puller was none other than our competition band Pipe Major, Mark Fournier. 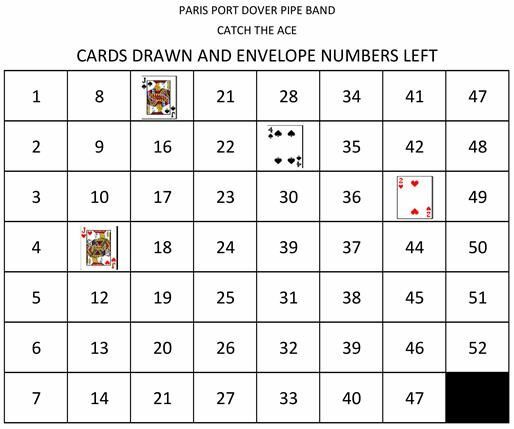 Our winner had indicated envelope 8 and 40 as her choices which contained the 6 of Hearts and the 9 of Clubs….the Ace of Spades is still in play! A modest growth in the jackpot this week to $415.50, but still growing! The jackpot is climbing quickly, already at 337.50!!!! Congratulations Ansley Forman! Ansley took home $73.00 from the weekly draw. 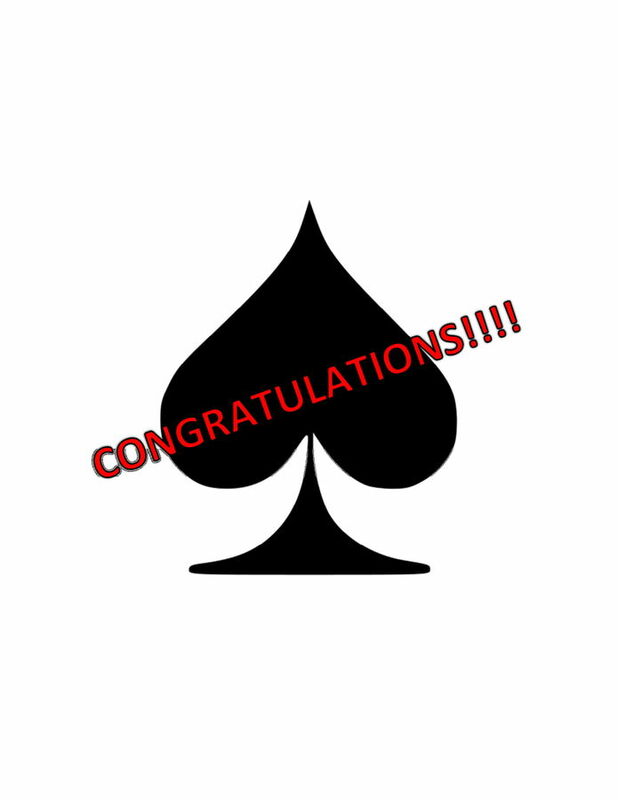 Her envelope choices of 15 and 29, bravely chosen randomly, did not reveal the Ace of Spades but the Jack of Clubs and the 4 of Spades…..
Congratulations Angelika Cieslinski!!!! The first weekly winner of our next lottery. Angelika’s prize is $72.00. 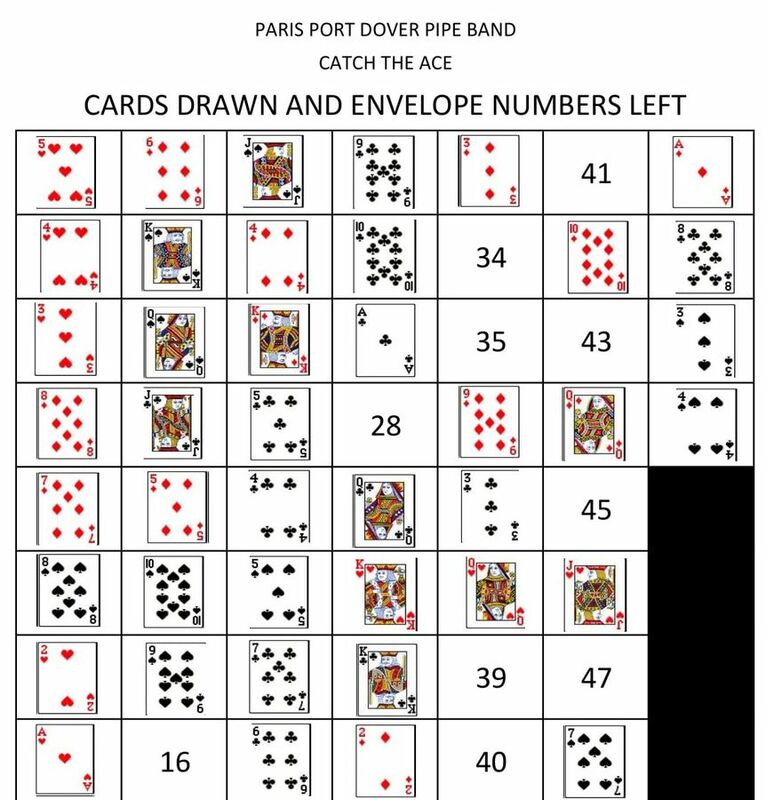 The envelopes chosen were 11 and 43 containing the Jack of Hearts and 2 of Hearts, respectively. Congratulations Tim O’Brien!!!!! Tim found the ACE OF SPADES!!!! It was in envelope 34. Fred Beale was the weekly winner this week!!! Congratulations, Fred! Unfortunately the Ace of Spades was not revealed. 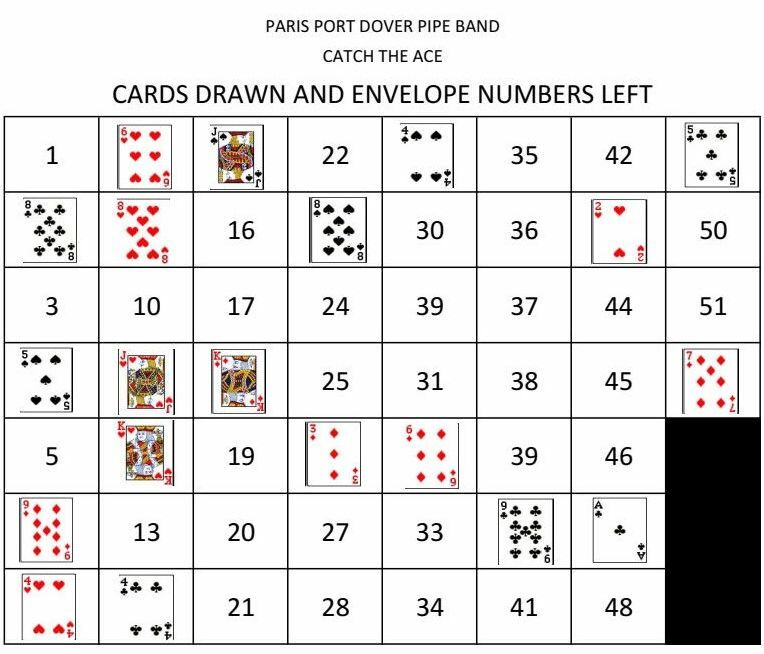 Fred’s envelope choices of 14 and 33 revealed the 10 of Spades and the 3 of Diamonds (sooooo close, eh Brad?). We are sold out for next week making the jackpot for next Thursday $3 931.50. That would buy some Christmas presents!!!!! Tickets are now available to our latest stage show! Congratulations Greg Roy!!!!! Our first double weekly winner!!!!! Unfortunately the Ace of Spades was not caught. 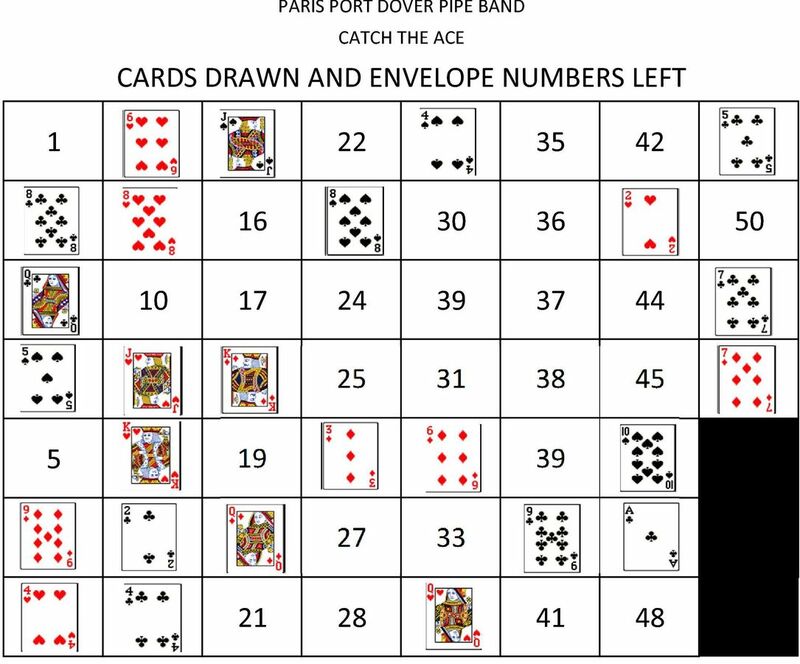 Greg’s envelope choices of 2 and 36 revealed the 4 of Hearts and the 9 of Diamonds…. Next week’s jackpot is at 3 706.00!!! That will buy a few Christmas gifts!!!! Congratulations Mike Gorman, this week’s winner. Mike’s envelope choices did not reveal the Ace of Spades. 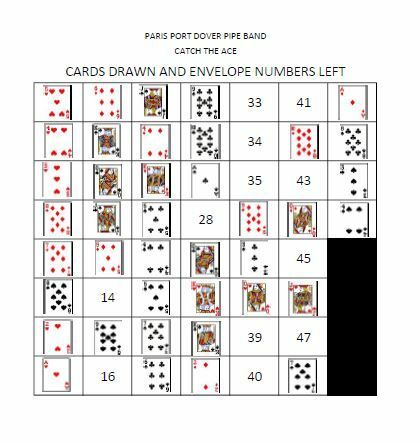 Envelope 5 had the 7 of Diamonds and envelope 9 revealed the 6 of Diamonds…the jackpot grows!!!! Current jackpot is 3 481.50! Congratulations Tim O’Brien!!! You won the Catch the Ace weekly prize of 150.00!!!! 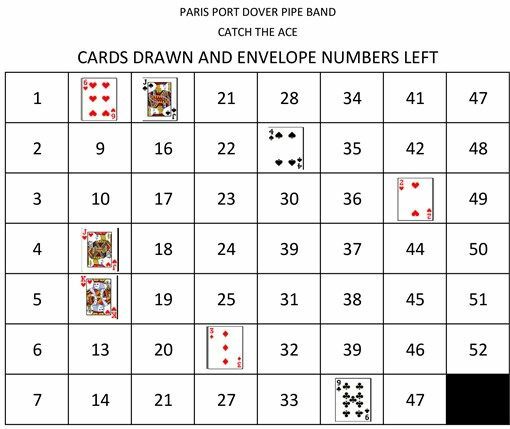 Your envelope choices of 20 and 23 contained the 5 of Clubs and the 7 of Clubs….the Ace of Spades was not caught!!! !